Short trips are so much fun. Those are like bonus points. Unplanned one are even better. 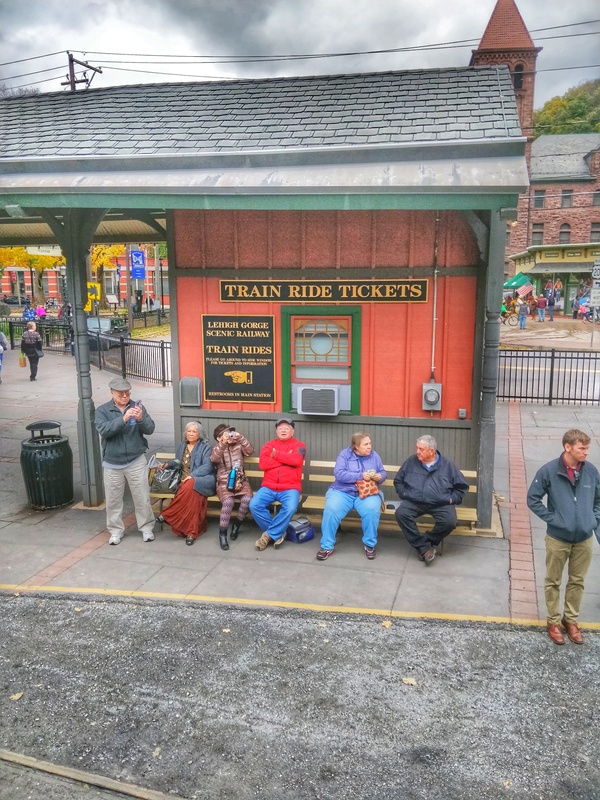 Our visit to Jim Thorpe, PA was one of that spontaneous trip. 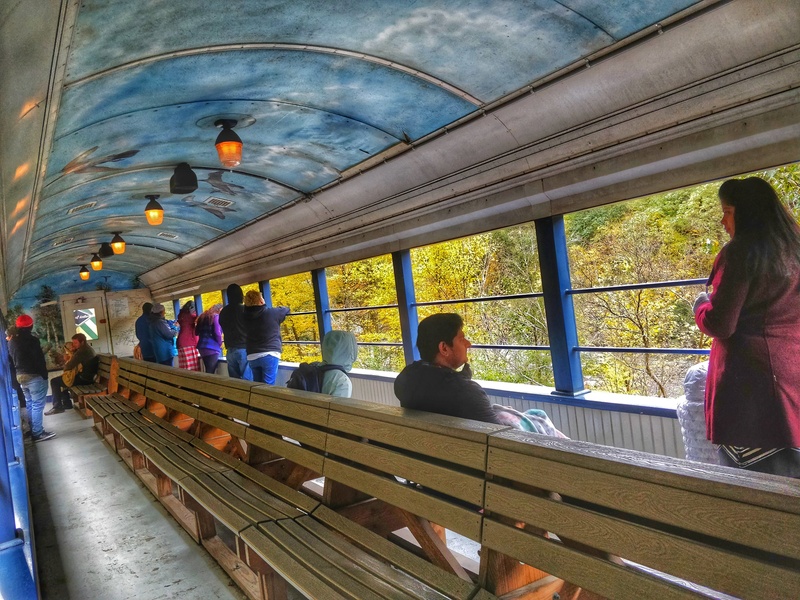 We heard about this place and about the Beautiful Lehigh gorge scenic railway train ride,from our friends and it was in our visit list for a month but that was just not materializing because of some reason. Finally, one not so fine morning (not so fine because of the cloudy, windy weather) we still decided to venture out as there was no rain in forecast for our destination. Fall was supposed to be on peak this weekend. It was a long drive of about 2 hours from New Jersey. The road trip itself was a pleasant one. Trees were illuminated in all shades of Autumn, Orange, yellow, red and green. We crossed few pumpkin patches, corn maze and potato farms. Small picturesque village houses were decorated for upcoming Halloween giving fall vibes. After taking a twenty minutes break we reached the small town nestled in the scenic Lehigh Gorge. The Victorian architectures of the town immediately caught our attention. Jim Thorpe was known as Mauch Chunk until 1954 and then re-named as Jim Thorpe after the famous native American Olympic athlete. The town is also known as the “Switzerland of America” due to the picturesque mountainous location, as well as the “Gateway to the Poconos”. Just next to the visitors center the small station was located. 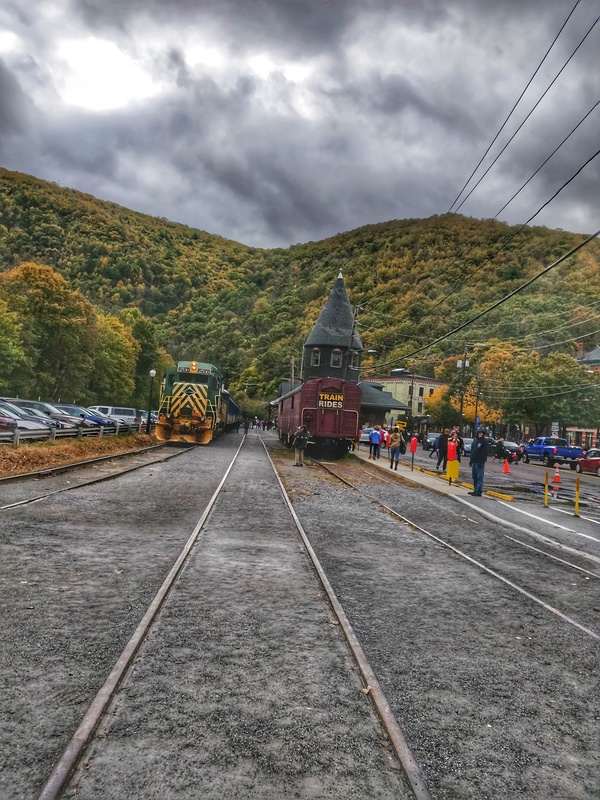 The Lehigh Gorge scenic railway’s next train ride was scheduled to depart soon. We quickly hopped in the train. The 45 minutes round trip covered the magnificent Lehigh River over bridges and the Lehigh Gorge State Park. As per the narration happening during the ride we came to know that the train’s vintage coaches are built as early as 1917. We could see people biking along the river bank and train tracks. The mountains were ablaze with stunning fall colors, as if nature painted a beautiful canvas and splashed all the colors. This was no doubt the best way to witness fall foliage. The whole train journey reminded me of our Ooty toy train ride. Once the ride was complete we grabbed some chicken sandwich and fries from the food stall outside the station and headed to the visitor center to know more. The visitor center is informative enough about the town’s history, culture and entertainment. They have plenty of exciting things to offer their visitors throughout the year. If you are an adventurous one, you can go for biking, camping, hiking, river rafting, winter skiing etc. For a fan of art, music and culture you can opt for the film festival or live music performances happens over weekend in the historic Mauch Chunk Opera House. 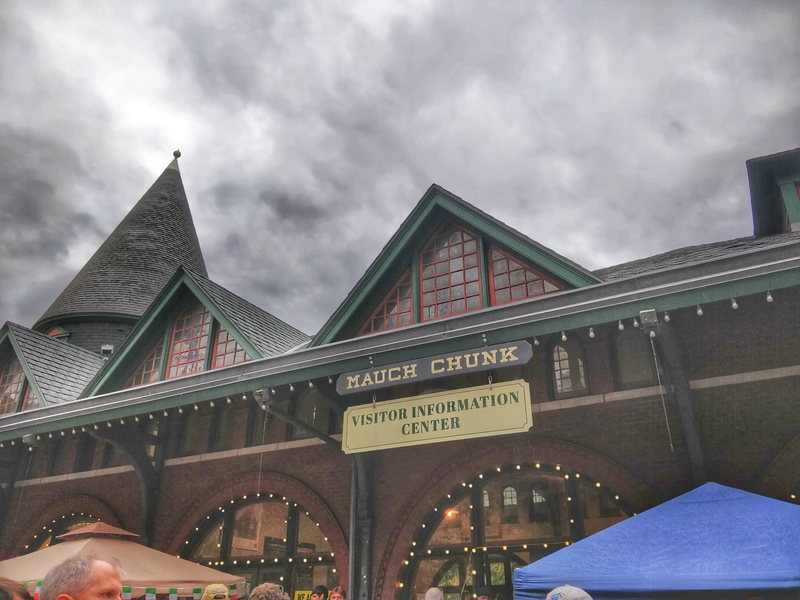 For a wanderer like me you can simply stroll around the streets of the sleepy town, visit Mauch Chunk Museum, Asa Packer Mansion and taste some wine in nearby winery. 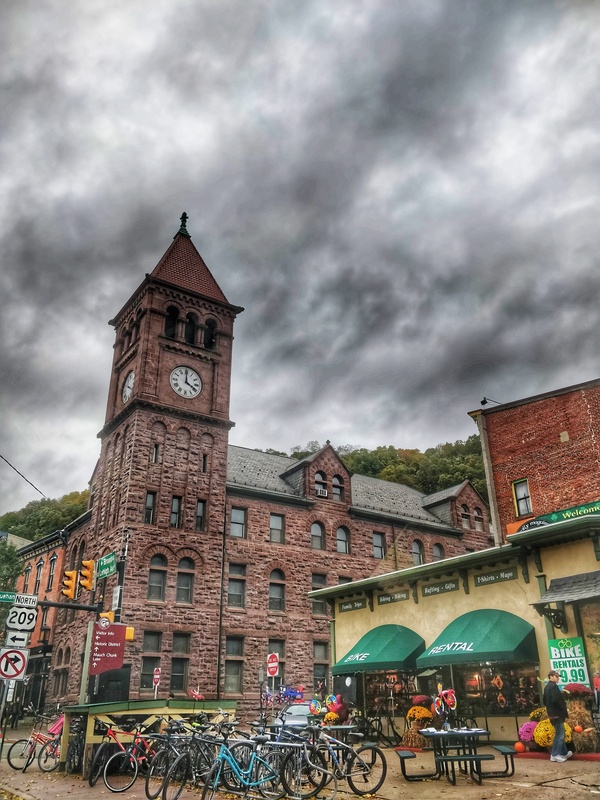 Even though it’s a year-round destination, but the most popular time to visit Jim Thorpe is Jul–Oct. The best month to visit is October as Fall Foliage Festival happens through the month featuring live entertainment, carriage rides and a scarecrow contest. It was a fun filled one-day trip for us as we came back the same day after spending few more hours. 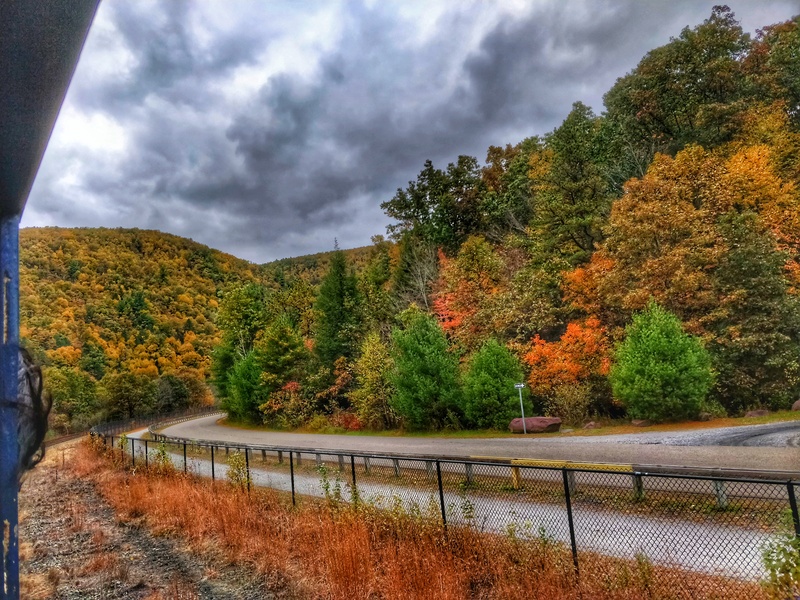 Either you plan for a day trip or spend your weekend over there, Jim Thorpe is no doubt a perfect weekend getaway. Beautiful place. Fall is better than spring. I think biking will be more fun here. Wonderful place to visit during the fall, I am planning to go for sure after seeing all the pics. The place looks sleepy but with full of colors of nature. I believe you people travelled at the right time. Good writeup! This is very fascinating, You are a very professional blogger. I have joined your rss feed and look forward to seeking extra of your fantastic post. Additionally, I’ve shared your web site in my social networks!